Every musician or music lover is all to familiar with that feeling: a secret fondness for a certain song you have been dying to play for as long as you can remember but somehow never got around to… Electric guitar quartet Zwerm and experimental duo (violin/electric guitar) Mr. Probe have joined forces to change all that! Complemented by drummer Mattijs Vanderleen and singer Gregory Frateur (Dez Mona), this seven-strong formation can perform as a rock band and an ensemble all at once. The recipe is simple: the musicians chose six pop songs they always dreamt of playing. Peter Vermeersch, composer and arranger for Flat Earth Society a.o. has come on board to arrange the songs for the band as a whole. Six Belgian and Dutch composers were subsequently asked to write a new oeuvre, inspired by one of the selected pop songs. The result: an adventurous concert in which familiar tunes dialogue with a new sound. 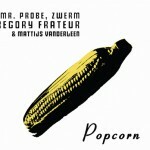 Popcorn is a production of Zwerm and Mr Probe in collaboration with Peter Vermeersch in coproduction with Champ d’Action, Neaux Productions and Q-O2 and with support of the Vlaamse Gemeenschap.